05.12.2011. Yet another jubilee has given Rittal plenty to reflect: On 1st December 2011, the Friedhelm Loh Group (F.L.G. ), of which Rittal is a member, invited 409 employees celebrating a personal jubilee to the Stadthalle civic centre in Haiger, the birthplace of the internationally active company group. 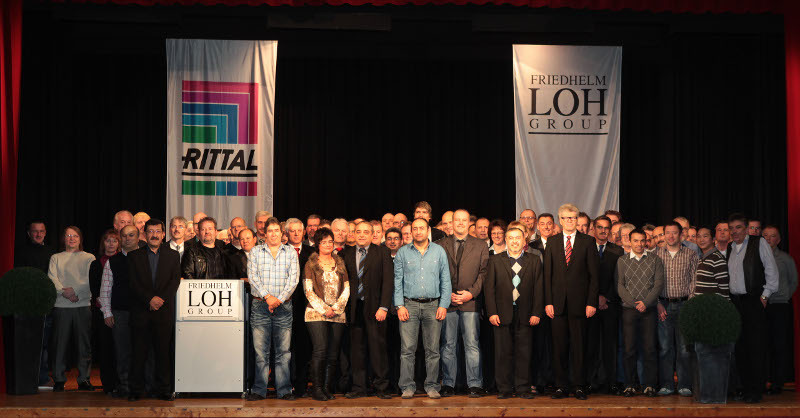 At this festive gathering, Friedhelm Loh thanked the employees who had already been contributing to the F.L.G. success story for 10, 25 or even 40 years. Eight employees reached 40 years with the company in 2011. Almost a hundred have now been F.L.G. employees for 25 years, and more than 300 joined the company group ten years ago. At the same time, special commendation was given to the four best trainees of 2011. 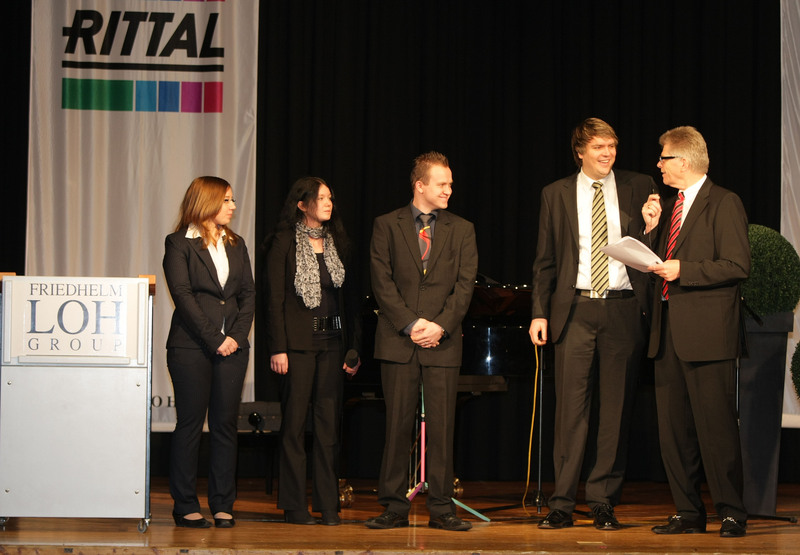 Parallel to Rittal's 50th anniversary, 409 employees are celebrating personal jubilees in the Friedhelm Loh Group. They have been witnesses to the long success story of the whole Friedhelm Loh Group and have made decisive contributions to developments along this road. Special gratitude for this commitment was conveyed by F.L.G. owner and board chairman Friedhelm Loh at a festive gathering in the Stadthalle civic centre in Haiger: "Iam proud of what we have achieved. And for that I would like to express my heartfelt thanks to all of you!" He continued: "You are celebrating your own jubilees in one of the most successful years in the company's history. And it is people who have shaped this success. Without you, the company would not have functioned for the past 40, 25 or ten years." In his address, Friedhelm Loh recalled company milestones from the years in which the audience had begun their careers at F.L.G. 1971 began with a shock for the company, with the death of founder Rudolf Loh at the age of 57 years. His wife and his oldest son Joachim took over the reins of Rittal, and the first steps towards an international presence were taken that same year: Rittal founded its first subsidiary in Sweden. Loh described the 1980s as the phase in which the most important decisions were made. At the beginning of the decade, for example, Rittal added enclosure climate control to its product portfolio. The subsidiary founded in the USA was also the company's first international branch office outside Europe. By the end of the 80s, company turnover exceeded 1 billion DM. When those celebrating 10 years with the company took up their employment, Rittal had already reached its 40th anniversary. Further highlights in 2001 were the launch of the TS 8 enclosure system and the opening of a new manufacturing facility for cooling units in Rennerod. The event in Haiger served not only for a retrospective, but also to welcome those who will be carrying the company's flag in the future. F.L.G. honoured the four best trainees of 2011. Office trainees Lisa Barbara Reffert and Sabrina Brück, and electronics specialists Raphael Gabriel and Marcus Krauße achieved grades between 1.1 and 1.8 in their final examinations. They will now be moving on to very different jobs in the Friedhelm Loh Group – with Rittal Overseas, Loh Services and the quality management group for climate control technology. Marcus Krauße has decided to continue his education with the so-called StudiumPlus programme, but will remain active for Rittal during his practical work experience phases. The Friedhelm Loh Group has developed continuously over the course of half a century. In the meantime, it counts more than 11,500 employees in ten German and 63 foreign subsidiary companies. The targets for the future are as ambitious as ever, building upon the past 50 years of success since the founding of the largest subsidiary Rittal. Annual turnover is set to increase to €3 billion by 2015. To this end, several thousand new jobs are to be created worldwide. And that promises many more employment jubilees to come. Image 1: A total of 409 employees of the Friedhelm Loh Group celebrated their own ten, 25 or even 40-year jubilees during the Rittal golden jubilee year. Image 2: Sabrina Brück, Lisa Barbara Reffert, Raphael Gabriel and Marcus Krauße (left to right) were honoured by Friedhelm Loh as the best trainees of 2011.